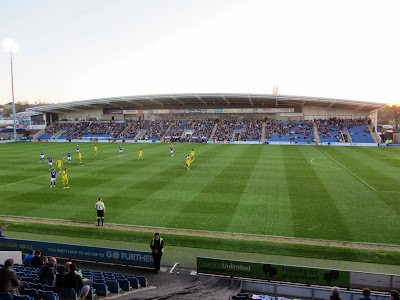 My eighth ground of 2015 was on Tuesday 14th April at the Proact Stadium in Chesterfield, Derbyshire. The match was Chesterfield vs. Colchester United in Football League One. The Proact Stadium was part of a regeneration project of the former glassworks in the Whittington Moor part of the town and sits adjacent to a large Tesco store. 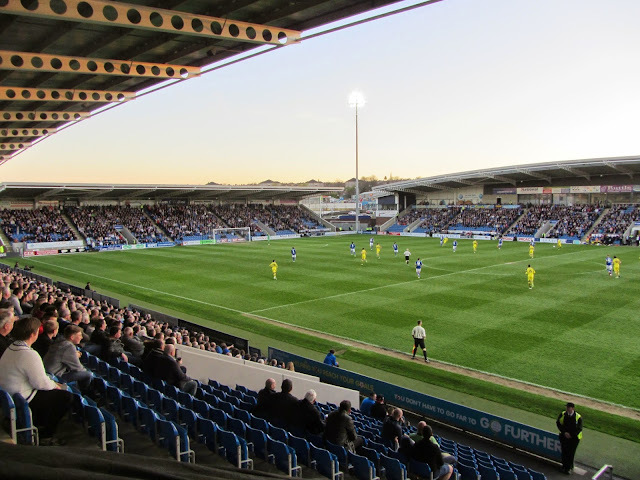 The venue is around 1.5 miles north of Chesterfield railway station and has been home to the club since 2010 when they moved from their Saltergate home where they had been for the previous 139 years. The ground is pretty typical of modern new builds with four separate stands of similar heights though the East and West Stands have curved roofs. There are gaps in each corner which can be filled in should the club ever need to expand the ground. The West Stand is also known as the Main Stand and has 3,144 seats as well as executive boxes and conference areas towards the rear. The outward facing side of the stand has the club reception, ticket office and a small club shop. Opposite this the East Stand has 3,208 seats and is sometimes used for away fans. This stand has a health club, cafe, community centre and play area contained within as well as a memorial garden at the back of the car park. The North and South stands behind the goals have flat roofs and both have a capacity of just over 2,000 each. Away fans are often positioned in the North Stand though on my trip we were in the East Stand. 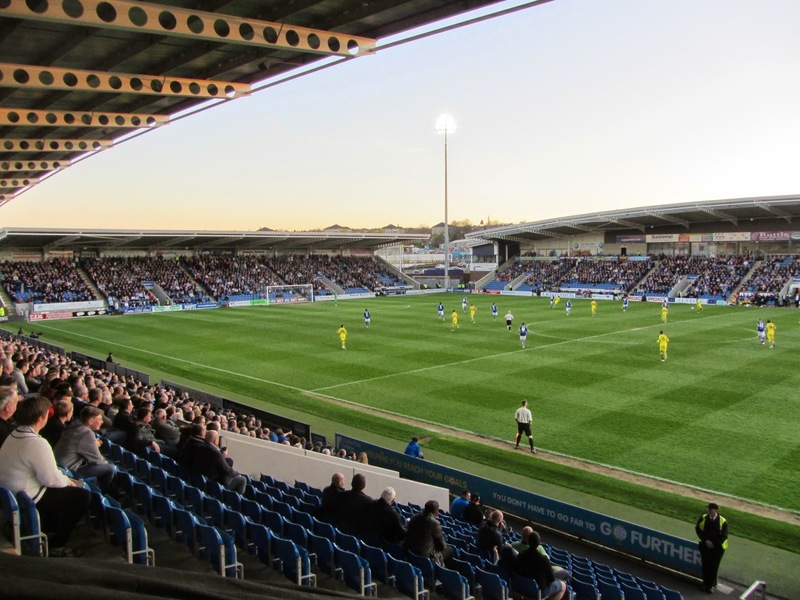 Chesterfield came into the game on a strong run of form and took the lead after 6 minutes - Drew Talbot's cross into the box found Gary Roberts who took advantage of a defensive slip to steady himself and volley the ball into the back of the net from 12 yards. In the 16th minute Dan Gardner slipped past Colchester defender Alex Wynter with ease before pulling back for Sam Clucas to smash the ball into the roof of the net. Less than 60 seconds later it was 3-0 as some atrocious defending by Colchester allowed Sam Clucas to ghost past three defenders and chip the ball over Chris Lewington. The game was over as a contest by this point though the visitors were able to arrest the scoring until at least half-time. Colchester made a triple substitution at the interval at the break to try and turn things around but if anything the second half was even more one-sided than the first. In the 58th minute Dan Gardner took a speculative 20 yard shot which was spilled into the back of the net by Lewington in the U's goal. A couple of minutes later it was 5-0 after more horrendous defending led to Jimmy Ryan beating the offside trap and chipping the ball in from close range. The hosts continued to batter the visitors who had Lewington to thank for keeping the score down to single figures. In the final few minutes there was yet another shocking attempt to play offside against Gary Roberts which led to him being felled by Lewington in the area. Roberts brushed himself off and dispatched the penalty to round off the scoring. A brilliant performance from Chesterfield against an appalling Colchester who were lucky to only lose by six.